Capturing all the admiring glances on the Nissan stand was the NISMO 370z, overshadowing both the GT-R Nismo and Juke Nismo RS. Pumped up with a redesigned front-bumper with larger air intakes and LED running lights, black headlamp surrounds, tweaked side-sills and special badging plus new 19-inch Rays alloy wheels in a black and silver finish there's no denying this car's visual impact. Otherwise it could be said it's more of the same, with standard red and black detailing on a pearl-white body - though the cartoonish proportions help keep it striking. Inside the changes are even less obvious, with Recaro bucket seats especially designed for the 370z Nismo with lightweight shells to imrpove seat rigidity and reduce weight. They're finished in a mix of black and red Alcantara, in-keeping with the exterior design elements. Already a strong performer, there's been no upgrade in power for the new 370z Nismo - but that means the 3.7-litre V6 pertrol engine's still got 339bhp and can sprint from 0-62mph in just 5.2 seconds. There have been some suspension tweaks though, primarily to improve ride comfort, and the refinement has been further improved with new carpets and sound-deadening. 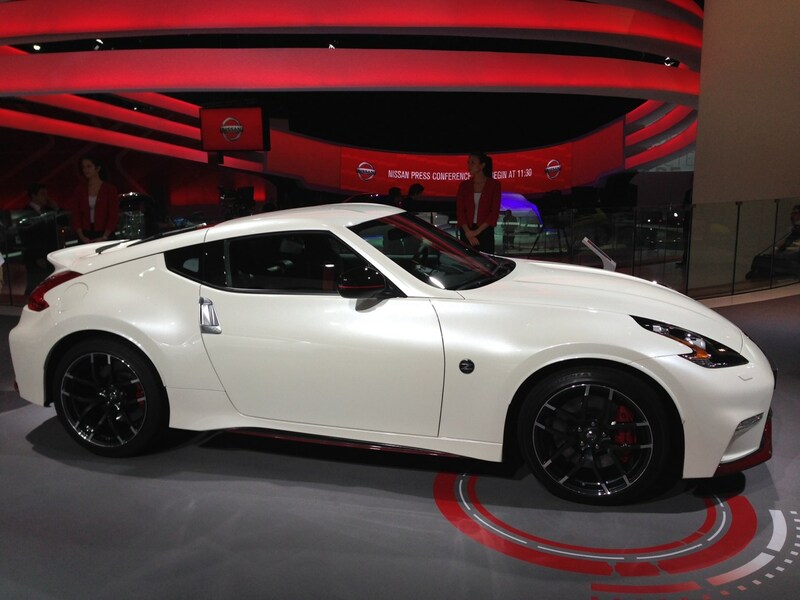 Much of the same has been applied to the standard 2015 model year 370z also. Nissan launched its new hotter Juke Nismo - badged RS - at Paris, complete with 18bhp power upgrade, sharper handling, stronger brakes and more standard equipment. Having seen strong demand for the standard Juke Nismo the more focussed car was an obvious next step. The 1.6-litre DIG-T engine has had its powerr increased from 198bhp to 216bhp while torque follows the same lead with a jump from 250 to 280Nm - though the four-wheel drive model's torque is unchanged. These do come with the firm's Xtroni eight-speed automatic gearbox though, with paddle shifters on the back of the steering wheel for manual control. Choose a Juke Nismo RS without four-wheel drive and you'll benefit from the new standard-fit mechanical limited slip differential on the front axle though. Each gets a retuned exhaust to improve the noise, while brake discs have increased in size and the suspension has been tweaked for better response. You'll spot RS versions of the Juke Nismo thanks to red brake callipers and discreet bading inside and out. Inside special Recaro bucket seats are an option. Paris was the first public debut for the Nissan Pulsar, but the hot news was the addition of a new sporty model using the firm's 1.6-litre turbocharged four-cylinder petrol engine. Producing 188bhp and 240Nm of torque it promises to liven up what could be considered a rather staid family hatchback thanks to sharper performance - even if it's telling the release didn't make mention of any 0-62mph times. The firm has been more loose-lipped about the Pulsar's economy and efficiency claims though, suggesting that despite the output the DIG-T 190 will return 47mpg and emit 138g/km of CO2. Available in both Acenta and Tekna trim the Pulsar DIG-T 190 comes with new alloy wheels (17- or 18-inch), black headlight surrounds, a chrome exhaust finisher, white stitching for the seats and steering wheel plus alloy pedals., It'll go on sale in the UK in Spring 2015. 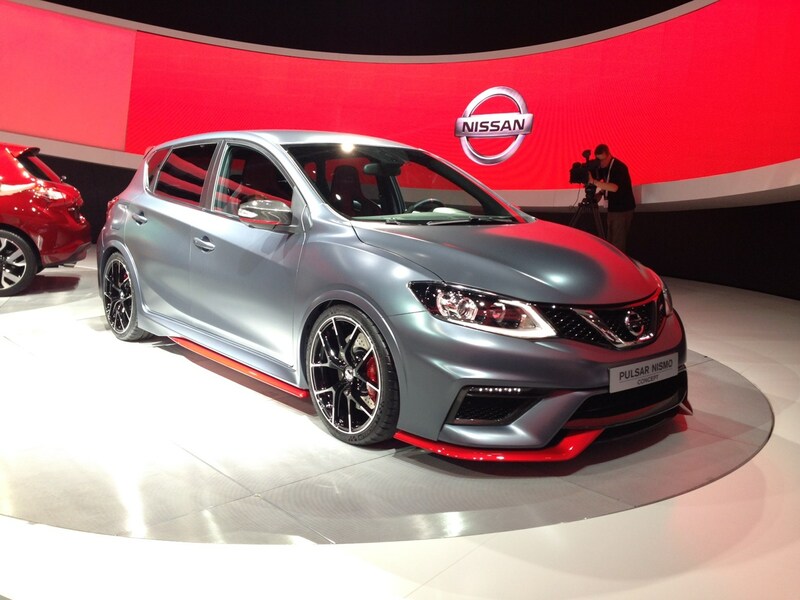 One Pulsar that, currently, isn't going to be offered for sale is the Pulsar Nismo concept. The tuning division's idea for a flagship hatch features distinctive Nismo styling updates and race inspired touches inside and out. Massive 19-inch alloy wheels fill the flared arches while twin central exhaust outlets emphasise its sporting intentions. Along with the red side skirts theres a carbon fibre rear spoiler and an interior with red-coloured rev-counter and sculpted sports seats finished in Alcantara trim. There's no news about what engine powers this concept, though we can expect it to be something similar to the DIG-T 190's 1.6-litre turbo, but we do know it has a suspension set-up that has been developed on the racetrack with a lower ride height and revised steering for better response. Maybe, just maybe, if public response is strong enough then Nissan might even build it.